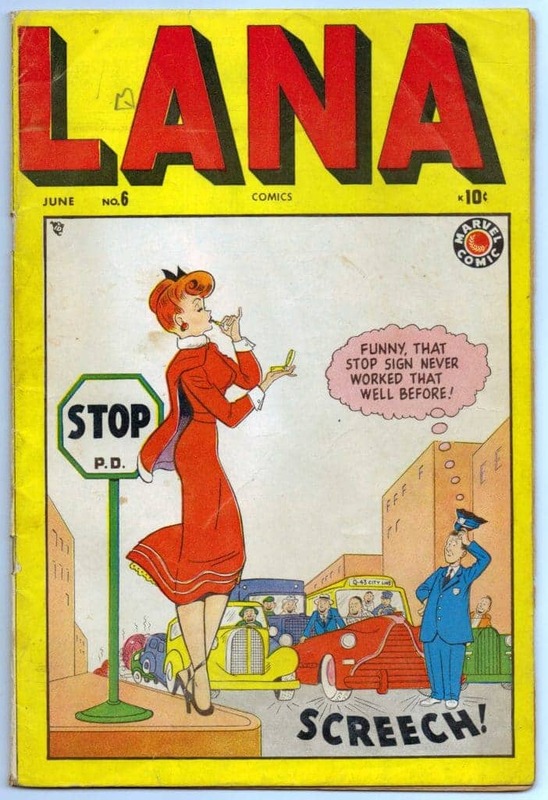 Lana Comics #6* (June 1949) was yet another title from publisher Marvel/Timely tied to its large stable of female working gal and teen humor books that included Hedy, Jeanie, Margie, Millie, Mitzi, Nellie, Patsy and Tessie. 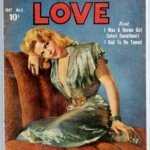 Lana only lasted for one year (7 issues) published between August 1948 – August 1949. The series limped on two additional issues as a Little Lulu rip-off, titled Little Lana. Lana’s full name was Lana Lane (not to be confused with Superman Comics Lana Lang or Lois Lane). This Lana worked as a showgirl. She palled around with chums Mickey Murphy, Clara Bright, E. Worthingtom Hamm, Douglas Manning, Ma Murphy. Other supporting characters including Swifty, Eve Noble, Snoopy Seeley and Lemuel Lushbert.